Robert Vojakovic, the President of the Asbestos Diseases Society of Australia (ADSA) and a long-term critic of James Hardie and its tame MCRF, flew to Holland from Western Australia to attend the protest and the AGM. Robert Vojakovic joins protesters on the picket line. 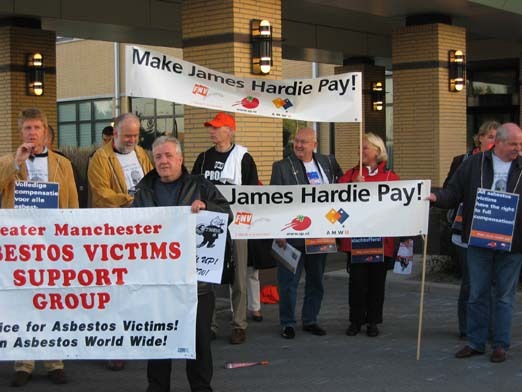 This ruling is a resounding success and offers hope for Hardie's Australian asbestos victims. The ruling has addressed issues of improper practice and corporate ethics and will, hopefully, dissuade other corporations from attempting to evade their responsibilities. Upon the release of Jackson's report, New South Wales (NSW) Premier Bob Carr affirmed the Government's intention to make Hardie pay up and threatened to boycott Hardie building products; NSW government purchases account for 8.1% of Hardie sales. 1 In 2001, having received overwhelming support from its shareholders, James Hardie Industries Ltd. was transformed into James Hardie Industries NV, a Netherlands-based company. The fact that there was no treaty between Australia and the Netherlands which would allow Australian asbestos victims to bring compensation claims before Dutch courts may have been a factor in the company's decision. 5 On September 15, there were protest marches and rallies in Sydney, Melbourne, Brisbane, and Adelaide and a series of workplace meetings in Tasmania.